Back Row – Dave Sothern, of; Adamson, p; Willis, p; George “Reggie” Rawlings, of; Andrews, p.
Not pictured – “Hank” Hulvey, p-3b-of. 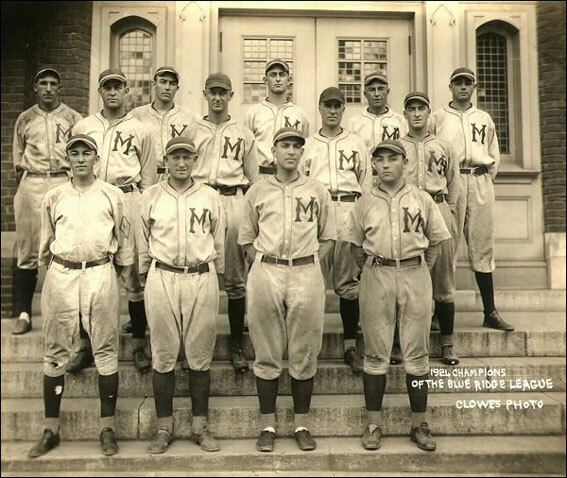 The 1924 Class D, Blue Ridge League season proved to be an exciting exhibition of baseball, as the defending champion, Martinsburg Blue Sox, successfully retained their league title by the closest margin of victory in league history. Martinsburg, managed by Bill Curtis, finished the season with 59 wins and 38 losses, good for a .608 winning percentage. The Blue Sox closest rival, the Hagerstown Hubs, managed by former league player, James Kieffer “Bugs” Snyder, won 60 games, but lost 39 contests, finishing with a .606 win percentage, just two-one hundredths of a percent behind the Blue Sox. Hagerstown had led the league standings for most of the season, before Martinsburg caught them the final days of the season to take the title away from them. Martinsburg was led by veteran outfielder, George “Reggie” Rawlings, who led the league with a .379 batting average, 31 doubles, 21 home runs, and 152 hits. Outfielder Dave Sothern and 2nd Baseman Dave Black were among the key players on the Blue Sox pennant winning club. The Hagerstown club was led by a trio of hitters, first baseman Bill Satterlee, who batted .353, outfielder George Thomas (.348), and catcher Strickler (.347). Snyder batted .307, and 2nd baseman Luke Kaunas, shortstop Boyle, and 3rd baseman Joe Conti anchored one of the best infields in the league. The Hubs also brought in former Frederick ace pitcher, Bill King, to finish out the season, but to no avail. The remaining four clubs finished below .500. Chambersburg finished a distant third place finishing 47-52 (.479 win pct. ), while Hanover was fourth (44-53, .454 pct). Frederick was a distant fifth (44-56, .440 pct), and Waynesboro rounded out the standing at 40-56 (.417 pct). Among the future Major Leaguers sprinkled around the league that season included Frederick outfielder Chick Fullis, who finished second behind Rawlings with a .353 batting average, and pitcher/outfielder “Hank” Hulvey. Al Kendricks, who pitched six games for Hagerstown, also made cup of coffee in the show.